Lysa Myers began her tenure in malware research labs in the weeks before the Melissa virus outbreak in 1999. She has watched both the malware landscape and the security technologies used to prevent threats from growing and changing dramatically. Because keeping up with all this change can be difficult for even the most tech-savvy users, she enjoys explaining security issues in an approachable manner for companies and consumers alike. Over the years, Myers has worked both within antivirus research labs, finding and analyzing new malware, and within the third-party testing industry to evaluate the effectiveness of security products. As a security researcher for ESET, she focuses on providing practical analysis and advice of security trends and events. The opinions expressed in this blog are those of Lysa Myers and do not necessarily represent those of IDG Communications, Inc., its parent, subsidiary or affiliated companies. Has the word ‘breach’ has outlived its usefulness? The cyber kill chain breaks down each stage of a malware attack where you can identify and stop it, but be aware of how attack strategies are changing. Training your employees how to recognize and avoid phishing only works if trusted emails don’t look the same as criminals'. Security and diversity mean being compliant and fair, but also mean you need to get the widest possible range of perspectives. Keeping the enterprise secure, even when users need to do things that are considered risky behavior. Trying to contain farm animals who are surprisingly creative and adept at getting around barriers has a lot to teach us about how to approach our efforts at protecting data from crafty users. Technical ability is only a starting point in developing useful, secure and powerful technology. If we take steps to better understand and represent a wider user base, we can get significantly improved financial results. Why go to women-focused technology events? Why would a woman who's perfectly comfortable in groups predominantly populated by men want to step out of her comfort zone to attend women-focused technology groups? 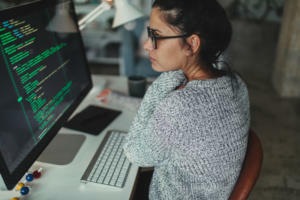 What is key to improving the ratio of women in cybersecurity? The biennial (ISC)2 report shows that the percentage of women in cybersecurity remains unchanged. Given the significant shortfall of security talent, what can we learn from this report about how to fix our weak and leaky pipeline? Protecting ourselves online can be incredibly complicated for anyone who isn't an expert, which has led to the current dismal state of security. Now the time for big changes to make things simpler.